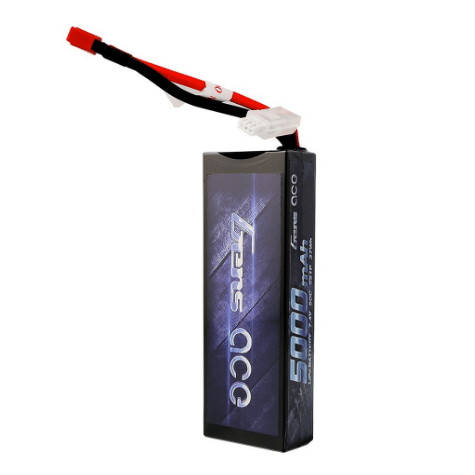 To get the best performance out of your RC car, you need the best battery. LiPo batteries are the best rechargeable batteries that you can use in RCs, so we picked the best three on the market. Batteries are what power electric RCs. Its like the gasoline for cars, except there are way more options when it comes to batteries. There are multiple types of batteries, ratings, wires, and so much more to keep track of. Since it can be kind of confusing, we included some information at the bottom of the list explaining more about the numbers on the batteries, and what they mean. The Most important number to look out for is the Mah rating. That stands for milli Ampere hour, which really just means the capacity of the battery. In general, the higher this number, the longer the battery is going to last. All of the batteries we reviewed have at least 5000mAh, which should be plenty of capacity for you to operate your RC car for a reasonable amount of time. The battery that tops this list is the Gens ace LiPo Battery Pack 5000mAh. This battery has been tested by many people, and receives great reviews. The Gens ace is a 5000mAh powerhouse that packs a punch with a 50c discharge rate. If you really need a speed boost, this is the battery for you, as it has a max burst discharge rate of 100c! Also, it is a 7.4V battery with two cells, which is standard for RC car batteries. The nice thing about this battery is that even though it is great for RC cars, it also works with boats, trucks, and planes. This battery recharges quickly, and also has an extremely long lifecycle, lasting up to 150 full charges at a minimum. The battery has been reported to last up to 40 minutes or longer, depending on the set up. Even though it seems almost all LiPo batteries are the same, the Gens ace really stands out from the pack. It has great ratings, and the battery was designed with all of the latest power technology meaning it outperforms other batteries as well. All of this, and it can be had at an amazing price. 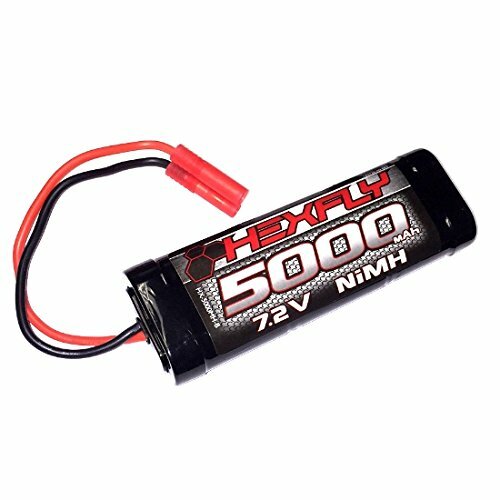 The second best battery option for your RC car is the Redcat Racing Hexfly 5000mAh. This battery has been around for some time and has stood against the test of time, and still is one of the best you can use for your RC car. 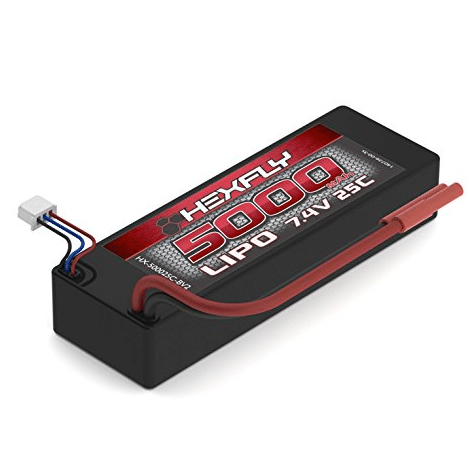 Redcat Racing makes great quality LiPo batteries, and this Hexfly 5000mAh is no exception. They build all of their batteries with durability in mind, as they use hard cases and heavy duty wiring. Expect this battery to last you a long time. The battery has above average power ratings, at 5000mAh, and 25c discharge rate. It also has some pretty standard numbers with 7.4V rating and two power cells. Beyond the strong case and durable wiring, it uses a JST-HX balancing connector, which is convenient. Overall, the Redcat Racing Hexfly 5000mAh is an incredible battery. Product testers only have good things to say about it, and almost everyone who uses one sees an increase in power, and operating time. What is also nice about this battery is the very affordable price. 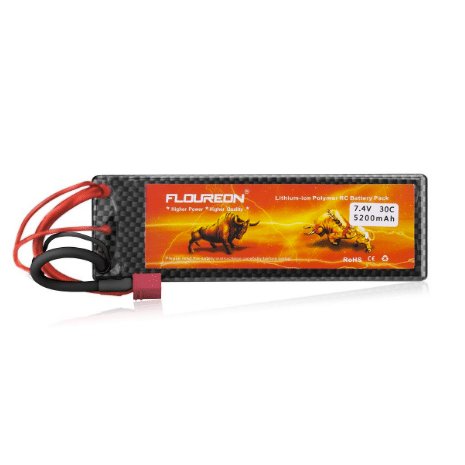 The third best LiPo battery for RC cars is the Floureon 7.4V 5200mAh. This battery combines great specs at an insanely low price. Not only can its specs compete with higher cost batteries, it blows them out of the water. We should start this off by saying this battery has a higher mAh rating than the other two batteries in this review, at 5200mAh. That means that you can really enjoy an extended period of time driving around your RC car before you have to swap out the battery or call it quits for the day. It also packs some power at a 30c discharge rate. Otherwise, it has the pretty typical 7.4V, two cell set-up. This battery is super light, weighing in at just 10.23 ounces. Any additional weight you have to strap onto your car will slow you down, so the light weight of this battery increases your speed even more! This battery comes with a Deans T plug, so make sure that your RC set up is compatible. On top of all of the great specs, this battery manufacturer also guarantees satisfaction by offering a one year warranty. But the warranty hardly seems necessary as this is a bottom dollar battery, costing less than most. 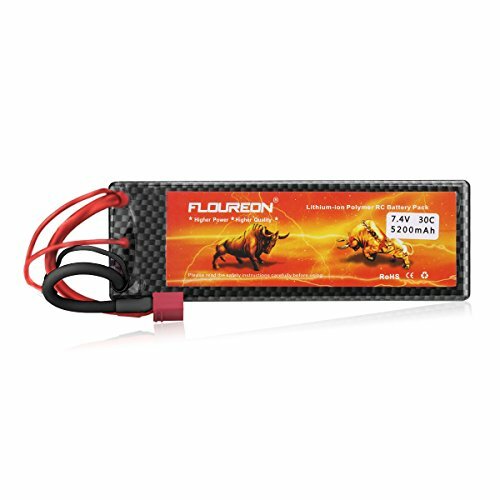 【What You Get】Floureon 7.4V 2S lipo battery 5200mAh 30C deans T plug with 1 year warranty and friendly customer service. 【Voltage Note】Please check whether the battery surface is alright when you get it and whether the voltage is between 3.7~4.2V before using. 【Specification】Material: Li-polymer; Battery voltage: 7.4V; Cell: 2S; Cell voltage: 3.7~4.2V; Capacity: 5200mAh; Discharge: 30C; Discharge plug: Dean-style T connector. 【Dimension】5.45x1.85x0.98inch; Net weight: 10.23oz. All Floureon products sold by SEVESTO are comply with RoHS, CE, MSDS, UN38.3 standard. 【Application】RC airplane, RC helicopter, RC car, RC truck, RC boat, drone, FPV, Skylark m4-fpv250, Mini Shredder 200, Indy250 plus mojo 280, Qav250, Vortex and Emax nighthawk 250 (Only if the voltage, dimension and the plug match, then it will fit). When it comes to batteries, there are a few different types: Alkaline, NiCD, NiMH, and LiPo. Alkaline – Alkaline, or disposable batteries, are the ones you buy in packs at a convenience store, such as AAs, AAAs, and so on. These batteries may be more affordable up front, but over time, they will cost more as you will always have to replace them. NiCD – These batteries are made with Nickel Cadmium, and used to be the best technology in batteries. However, they have since been replaced by better performing NiMH and LiPo batteries. NiMH – NiMH batteries are built with Nickel Metal Hydride, which gives this battery type better performance than NiCD batteries. This is a common type, and is very commonly found in RCs today. 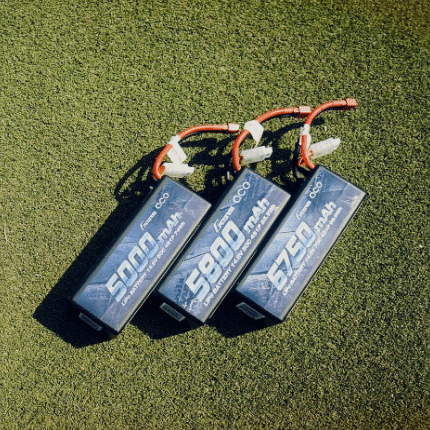 LiPo – This is the most modern commercial RC battery type, and is therefore the best performing. It will usually last longer, and have a harder punch than other battery types. The one drawback is these batteries tend to cost more. 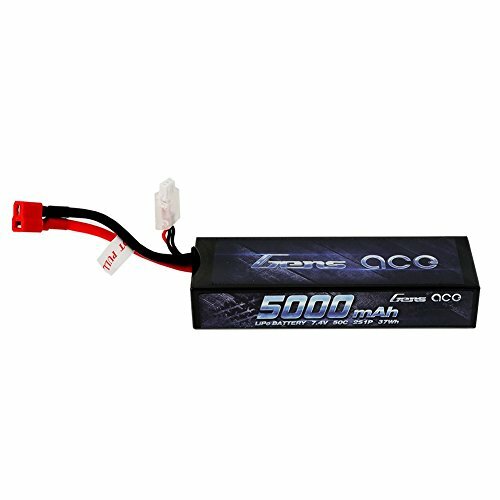 The type of battery you choose will likely depend on your needs and budget, as well as the RC setup that you are running. If you have any other questions, consult our accessories page that has more information. mAh – This is the Milli Ampere Hours, which is a measurement of how long a battery can last. It is essentially the capacity of the battery. C – This is the discharge rate. A higher number means more power at full throttle. V – This is the voltage of the battery. S – This unit notes how many cells there are in the battery. If you want to check out other battery reviews, or are looking for other items or mods for your RC, be sure to check out our accessories page and posts.